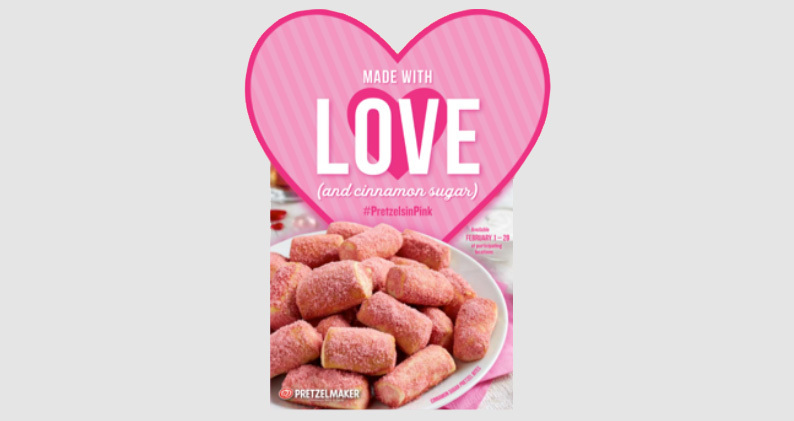 ATLANTA (Feb. 4, 2019) – Pretzelmaker’s famous fresh baked pretzels are available pretty in pink this Valentine’s Day. For a limited time only, Pretzels and Pretzel Bites are available in Pink Cinnamon Sugar – a pink twist on Pretzelmaker’s popular Cinnamon Sugar flavor. They are the ideal way to share something sweet this holiday and are available through February 28, 2019 at participating locations. Customers who wear pink (a shirt, pants, shorts, skirt or hat that is predominantly pink) to stores on Wednesday, February 13, 2019 will receive a free* Buy-One-Get-One Pink Cinnamon Sugar Pretzel when they say “On Wednesday, we wear pink.” Participating locations only in the U.S.
For more fun from Pretzelmaker and store locations, visit our website or join us on social media: follow @pretzelmaker on Twitter; add @pretzelmakerpics on Instagram; follow “Pretzelmaker” on Snapchat; or become a fan of the brand on Facebook. Members of the media are invited to Pretzelmaker locations to try the limited time pink pretzels. To request an interview with Pretzelmaker representatives, coordinate a store visit, obtain photos, graphics or b-roll, please contact Kathleen Shaffer at kshaffer@gfgmanagement.com or 470-388-6170. Since 1991, Pretzelmaker® has specialized in serving fresh baked, hand-rolled soft pretzel products, dipping sauces and beverages. Long recognized as an innovator in their industry, the brand is credited with inventing the popular Pretzel Dog, Mini Pretzel Dogs, and the portable Pretzel Bites. Following integration in 2010, the Pretzelmaker® brand now also includes Pretzel Time®. Pretzelmaker® is currently the second largest soft pretzel concept in the United States and is also rapidly expanding worldwide with locations in Canada, Guam, Saudi Arabia and Mexico. Pretzelmaker has recently introduced a new twist to the brand, the Fresh Twist by Pretzelmaker® concept. Fresh Twist by Pretzelmaker® is perfect for colleges/universities, airports and transportation centers. The menu offers breakfast sandwiches on pretzel buns, Cinnamon Toast Pretzel Sticks, Pretzel Flatbread Pizzas and Pepperoni Pretzel Rolls in addition to its fresh hand-rolled Pretzels, Pretzel Bites, Pretzel Dogs and all-natural lemonades and smoothies. To learn more, visit Pretzelmaker Franchise.